History: The South Dakota Chapter was formed in 1986 so that fundraisers in South Dakota could be a part of an organization that fosters professionalism and high ethical standards, promotes networking among fundraisers, and offers opportunities for continuing education. The chapter has grown to more than 100 members. Because our chapter represents a large geographic area, area groups meet regularly for continuing education and networking in Sioux Falls and Rapid City. In addition to those meetings, we offer continuing education during an annual conference at the National Philanthropy Day celebration and at other periodic trainings throughout the state. 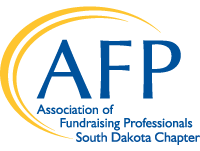 The South Dakota Chapter offers scholarships to attend the AFP Mid-America Conference, the AFP International Conference, our National Philanthropy Day conference, and for CFRE certification. "My membership in AFP has allowed me to make so many friends who share the same passion and drive for excellence as I do. The fundraising profession can be a difficult one at best, however, knowing I have the support of my fellow colleagues helps me to better serve my organization and my community. All of the resources available through networking as well as through AFP International are truly valuable." "The resources AFP provides have helped our organization raise more funds and even secured better wages for staff. From using the AFP website to tapping more knowledgeable professionals throughout the state, I have received much more benefit as a member of AFP than the dues I’ve paid into it. Fellow members of AFP have the expertise in raising funds in such a unique state, and are willing to show us the way through AFP’s Mentoring Program and conducting training sessions at state and local conferences. You get your money’s worth as an AFP member."